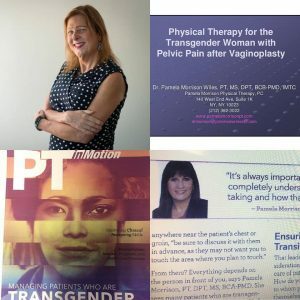 Pelvic Physical Therapy for the Transgender Patient - Pamela Morrison Pelvic Pain Physical Therapist, P.C. Pelvic Physical Therapy for the Transgender Patient - Pamela Morrison Pelvic Pain Physical Therapist, P.C. Our practice has been helping the transgender patient overcome pelvic pain and other symptoms they have due to transitioning surgeries. Dr. Morrison was the first physical therapist in the US to lecture nationally on the topic of physical therapy for the male to female transgender patient. She presented the surgeries they undergo, the overall costs, healing process, medications, post-operative pelvic pain issues, and how best to provide comprehensive care at the American Physical Therapy Association Meeting in 2012. Her audience included pelvic floor physical therapists predominantly. She also presented a male to female case study outlining all aspects of the physical therapy evaluation and the successful treatment provided. She presented how providing emotional support and understanding relationship and sexual issues were paramount in helping and making patients feel safe and understood. In addition, understanding social challenges in the transitioning patient helps us be better providers of care for the transgender patient. There was also a great article in The NYTimes Science Section today regarding this topic. Check it out!